Seoraksan National park was designated the 5th national park in Korea in 1970 and chosen as a nature preservation area on November 5, 1965 Also, internationally recognized for its rare species, Seoraksan is the area in Korea to have been designated as a Biosphere Preservation District by UNESCO in 1982, and in IUCN recognized its rich natural resources and labeled it category Ⅱ(National Park). 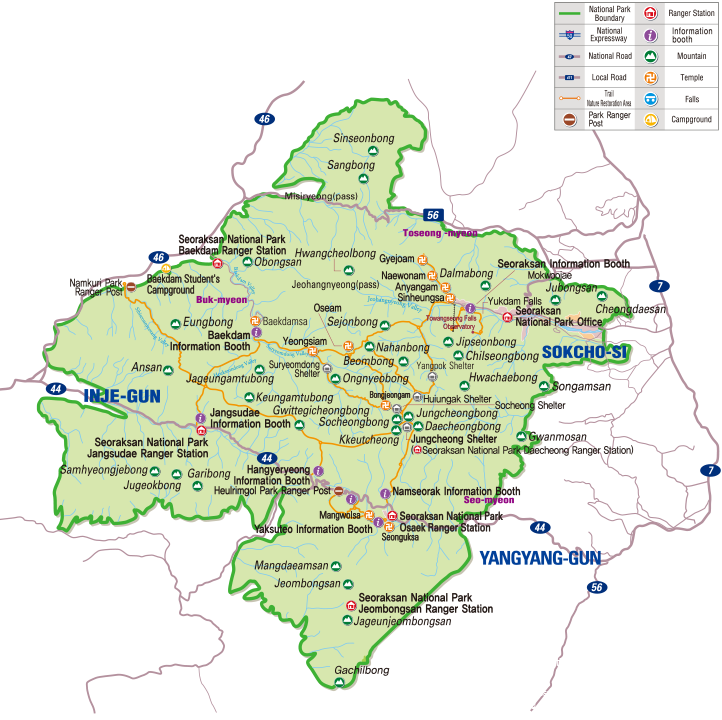 The total area of Seoraksan National park is 398.539㎢ and it is divided among the areas of Inge-gun, Goseong-gun, Yangyang-gun, and Sokcho-si, Naeseorak (Inner) is in Inje, Naeseorak (South) is the area from Hangyerteong (Ridge) to Osaek, and Oeseorak (Outer) lies in the eastern area across Sokcho-si, Yangyang-gun, and Goseong-gun. Including its main peak, Daecheongbong, Seoraksan has a total of 30 imposing peaks spread across its territory such as Hwachaebong, Hangyeryeong, and Madeungryeong. Over 2,000 animal species live in Seoraksan, including the Korea goral, Musk deer, and Other. There are also more than 1,400 rare plant species, such as the Edelweiss, here as well.